VARNIPLATE green colour is a coating plate system that has been designed to provide today’s printers with a cost effective reusable product. The product is made by a polyurethanic top coating surface, a second polyurethanic layer and a polyester carrier sheet and it should be used in conjunction with VARNICOMP SR compressible underblanket. The polyurethanic coating surface provides many of the benefits of a photopolymer coating plate but is much more robust in terms of handling and storage. 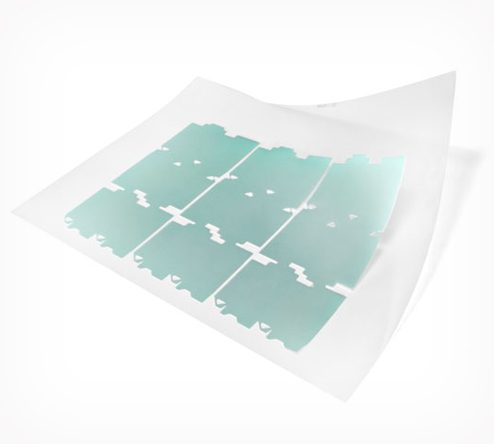 The polyester carrier sheet provides a very high level of dimensional stability which helps to achieve register even after several reprints whilst the specialized underblanket provides a uniform level of compressibility to help to laydown a consistent film of coating. Varniplate is available either as a 1.15 or 1.35 mm plate in combination with an underblanket gauged to suit each individual press manufacturers cylinder undercut. The underblanket VARNICOMP SR adhesive compressible layer is fixed on the plate cylinder for several months (6-12 months). VARNIPLATE 115-135 are fully compatible with UV and Water Based coatings, can either be hand cut or CAD cut and can easily be fitted with standard mounting bars, making this a highly versatile system. The compressible underblanket is supplied with either a non-adhesive or self-adhesive backing to give the option of being it permanently mounted.